A good preclinical candidate needs to be soluble in all relevant efficacy and in vitro ADME assays, and additionally needs to be able to permeate cell membranes. These physicochemical properties are evaluated using kinetic solubility, log D and PAMPA assays. After that, and considering the chemical structure, stability assays are established. At IRBM, we customize the screening cascade for each chemical series, avoiding “box ticking” but ensuring a smooth transition to in vivo studies in preclinical species. Initial stability testing is conducted using SGF (simulated gastric fluid), SIF (simulated intestinal fluid), plasma, and blood. This is particularly critical if labile groups, such as esters or amides are present in the molecule. Metabolic stability is assessed using microsomes from selected species (typically human microsomes, and microsomes from the species used in the efficacy model), or other subcellular fractions, if appropriate. We have successfully extrapolated intrinsic clearance with microsomes even for drugs subject to conjugative metabolism. Hepatocyte stability screening is included if metabolism does not mainly involve endoplasmic reticulum enzymes. Hepatocytes are used in suspension, or plated when longer incubation times are required. All the stability assays are detected using liquid chromatography-high-resolution OrbitrapTM mass spectrometry (LC-HRMS). HRMS data are acquired using quantitative/qualitative analysis. This allows for the quantification of parent compound disappearance, while identifying the main metabolic pathways. We have implemented novel approaches to assess stability of therapeutic peptides in plasma/blood and in subcutaneous tissue, that can be fully integrated on peptide discovery programs. Ultra-high performance liquid-chromatography coupled to HRMS and fast fraction collection (FC) (≤ 1 s/fraction) followed by microplate scintillation counting (MSC) is used for profiling radiolabelled metabolites in different tissues. 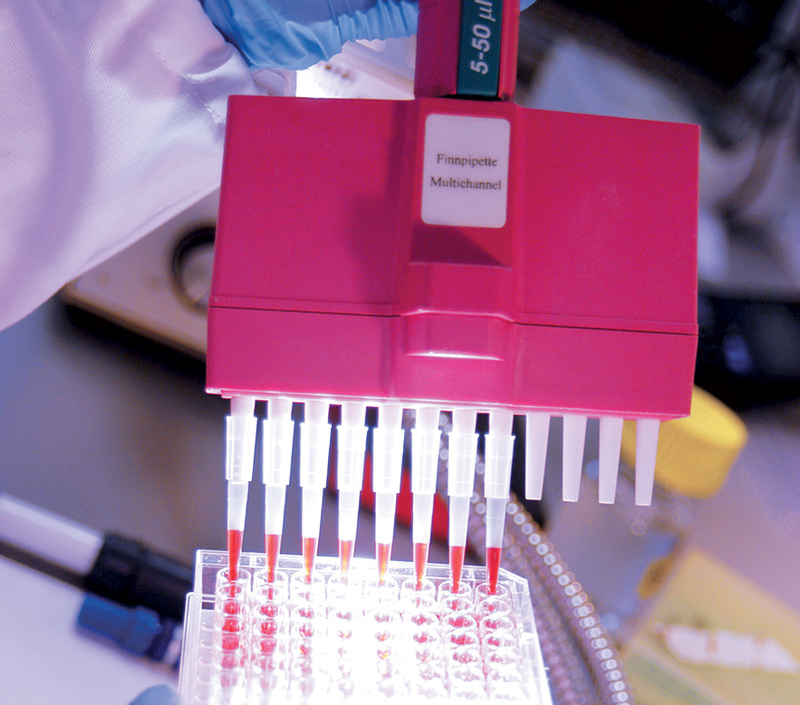 Distribution assays such as plasma protein binding (PPB), binding to microsomes or tissue homogenates and blood/plasma partition, are also available, with a variety of protocols for different throughputs. Assessment of brain penetration can be performed using an in vitro human blood-brain barrier model. Cytochrome P450 inhibition and induction potential is also determined using optimized protocols. Cytochrome P450s (CYPs) constitute a superfamily of isoforms that play an important role in the oxidative metabolism of drugs. Each CYP isoform possesses a characteristic broad spectrum of catalytic activities of substrates. Whenever 2 or more drugs are administered concurrently, the possibility of drug interactions exists. The ability of a single CYP to metabolize multiple substrates is responsible for a large number of documented drug interactions associated with CYP inhibition. In addition, drug interactions can also occur as a result of the induction of several human CYPs following long term drug treatment. From the viewpoint of drug therapy, to avoid potential drug-drug interactions, it is desirable to develop a new drug candidate that is not a potent CYP inhibitor or inducer and the metabolism of which is not readily inhibited by other drugs. In reality, drug interaction by mutual inhibition between drugs is almost inevitable, because CYP-mediated metabolism represents a major route of elimination of many drugs, which can compete for the same CYP enzyme. The clinical significance of a metabolic drug interaction depends on the magnitude of the change in the concentration of active species (parent drug and/or active metabolites) at the site of pharmacological action and the therapeutic index of the drug. The smaller the difference between toxic and effective concentration, the greater the likelihood that a drug interaction will have serious clinical consequences. Thus, careful evaluation of potential drug interactions of a new drug candidate during the early stage of drug development is essential. Although the criteria for potency are project and isoform-specific, potent inhibition is considered unfavourable and may preclude the development of a compound. For that reason, compounds can be categorised into the classification bands reported in the Table below. Luminescence-based assays, in 384-well plate format, are suitable for CYP screening during early Drug Discovery. These assays are an effective, cheap, and highly sensitive method for enzyme screening. On the other hand, *LC-MS or LC-MS/MS (liquid chromatography tandem mass spectrometry) is a more powerful, analytical approach to use in the later stages of drug development. Induction of CYP enzymes by drugs can give rise to significant clinical drug interactions. Induction of the major hepatic CYP3A4/5 enzyme is assessed in cultured human hepatocytes. Due to large inter-individual variability both in the expression of drug-metabolizing CYP and in the extent to which inducers can induce CYP enzymes in humans, experiments are conducted at least in 3 different donors of human hepatocytes. The assays are in 24-well plate format with the possibility to use both single and pooled donors. hERG (human Ether-a-go-go-Related Gene) is a gene encoding alpha subunit of potassium channel. This channel is responsible for the repolarizing current in cardiac cycle. The inhibition of the channel or mutations may cause the adverse condition called long QT syndrome. In the past few years, several drugs have been withdrawn from the market due to their interaction with certain ion channels that may cause life-threatening arrhythmias and sudden cardiac death. Invitrogen’s Predictor™ hERG Fluorescence Polarization Assay provides valuable information about possible binding of test compounds to hERG channel followed by QT prolongation on echocardiogram (ECG). Although manual patch-clamp testing is the gold standard for this purpose, biochemical hERG assay allows checking multiple compounds at the earliest stages of drug discovery. Screening compounds for hazardous side effects on hERG channel early in the drug development process is likely to cut the drug development costs. The assay is performed in 384-well format. The results are expressed as % of inhibition and an IC50 is determined in case of a significant hERG channel inhibition is observed.